It’s my birthday! I’m 60. Yikes! Time is officially up, in about 10 hours, for working on my 60th Birthday Bucket List of 60 new things to do before I turned 60. One more item will be finished tonight after dinner: “have a banana split at Bruesters on bring your own banana day.” Bring Your Own Banana Day is Thursday; my birthday falls on a Thursday—perfect! The final count on what I accomplished out of the 60 (actually 58) items on The LIST over the past year is 35 items done and 23 items not done. Interestingly enough, this comes out to about 60 percent done, which, though about a D- on my Dad’s most generous grading scale, is quite apropos! Last week’s blog talked about some reasons for failure not to achieve 100 percent done. Here are some more thoughts on this journey that I have taken over the past 12 months. First off, many thanks to my daughter Ali for suggesting the idea of doing a year-long bucket list. It was fun coming up with the list items, predominantly things I had never done before, and then having those specific goals to work toward, and I accomplished much more during the year than I would have without the incentive. Being old(ish) and retired requires a plan, and writing up and working on a list has given me a way to think about what I want to accomplish at this stage of my life and how I can be sure it gets done. Blogging on my own website and tweeting had been in the back of my mind, but having them on a list with a deadline got me going. Same with taking an online class (MOOC) and participating in National Writing Month. I’ll do all of those things again. Likewise, I wouldn’t have pushed myself to test drive that classic Mustang or even plant our rock wall gardens this year without them being on the list, nor would I have gotten myself organized to send birthday cards to all my cousins. Some items, like visiting Scotland and the Grand Canyon, were scheduled to happen before I wrote the list, so they were easy to check off. The fun part was being creative to add to the experiences, such as eating something weird in Britain and, of course, blogging about the experiences afterwards. Here are two comments on items that didn’t get done. First, I didn’t check off “attempt fiddling” even though I did actually buy a “learn to fiddle” book, get out the violin, and work through the first couple of exercises. Since I am a cellist, I thought fiddling would be easier to figure out than it has been so far, so I am not satisfied enough to call those attempts final. More work on it will be done. Second, I found the perfect piece of furniture to refinish, but my enthusiasm rubbed off on Bob, and he did it for me, and did a beautiful job too! No worries, there are always plenty of things that need refinishing. So here I am. Sixty. Old. But though my actual age might be well over the hill, my biological age is not. Case in point: over the Labor Day weekend I added a last-minute item to the bucket list, something I had never done before: tubing! 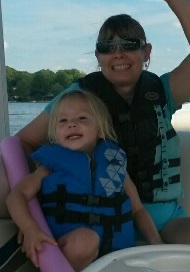 Friends of ours took our family out on their boat for some tubing fun, so Bob and I had a blast getting splashed and bumped across the lake with our 5-year-old granddaughter (not the 2-year-old in the photo from the same day). I had every bit as much fun as little Riley. And she and her cousins, bucket list or no list, are excellent reasons to keep on the young side, physically and mentally! Next Article Next Article: Try Mountain Biking—Done!